The original 7 day bootcamp to SMASH your to do-list, feel ENERGISED & INSPIRED that will have you SKIPPING out of the office on Friday evening! 18 months ago I was employed as a solicitor, working way more hours than I should have been. I was handed a mobile phone on my first day and quickly realised that the people I was working with would regularly work until 10 or 11pm on their laptops. I was to cover for 2 of them. I had founded Searching for Serenity 6 months beforehand, so I was in start-up mode and doing all the things, whilst working full time (and the rest!) as a lawyer. Oh, and I already had an established jewellery business that was ticking over. I could feel myself starting to sink; my to do list was crazy, I was at the limit of the work I could delegate or defer, everything was piling up. My life was quickly becoming work-only, obligation-only, no fun, no energy, no inspiration. I was constantly advised to step into joy, to do the things I loved, to stop working so damn hard... and all I could think was 'that's great, but where am I supposed to start??'. How can you start taking care of yourself when you're drowning in work and responsibility? How can you prioritise yourself when your 'phone won't stop ringing? Here's what I know though - I am far from the only person who struggles with deadlines and too much work. Have you spoken to ANYONE lately whose response to 'how are you?' hasn't included the word 'busy'? Busy is a badge of honour, it's a point of pride. We're in demand, we're cracking through it. I could already see from my own journey through energy sapping loss of resilience, burning out, working so hard I made myself ill, that if I didn't take back control, I was going to be back on that floor crying. ... and from this truth, Your Best Week was born. I designed this course for the woman I was at that stage; working 80-90 hours a week across employment and two businesses, juggling competing priorities, feeling like a bit of a failure on all fronts and prone to beating myself up. >> 7 days only - you'll be amazed what you can achieve in such a short period of time! Since that first intake 18 months ago, hundreds of women have taken this course. For many of them, it has been the first step in taking back control of their lives and careers, and rebalancing them in favour of living their lives in a more supportive, fun and healthy fashion. But let's not start with big lofty goals. Let's just smash it out of the park and go from there, shall we? I will be running Your Best Week LIVE from 11th June, with an accompanying private Facebook group for additional support, encouragement and coaching. Whilst our 7-day race starts on Monday 11th, I will be releasing brand new pre-work from Monday 4th June, t get you in tip-top shape as we start. Usually Your Best Week is priced at £47 - but for this live event, it's only going to be £7. Because this might genuinely be the first step to changing your life, and so it gets to be a hell yes, no-brainer of an offer. You have almost nothing to lose, but if you get control of your workload, start taking back control... what might you gain? Who is Leah and what is Searching for Serenity? Leah is a non-practising solicitor, mentor to ambitious, driven professional women who have had enough of living to work. Originally called to the Bar of England and Wales in 2007, Leah spent the next 5 years working multiple jobs as she built her career, first as a personal injury specialist, managing a caseload of up to 300 clients at any one time, before switching to Contentious Wills, Trusts & Estates as a mental capacity specialist upon qualification in 2012. Over the subsequent four years she was featured in Private Client Adviser Magazine, contributed to Wilmington Publication's Special Report Expert's Guide, speaking extensively at events nationally, including bespoke training for charities, lawyers across Wales and the South-West and speaking at the Association for Personal Injury Lawyers conference as an expert on paying for care. Following a sudden and shocking bereavement at the end of 2014, Leah was forced to re-assess her priorities and embarked on a journey of self discovery and development. Applying the same work-ethic to researching, learning and developing she healed her own burnout and resilience issues and went on to found Searching for Serenity whilst still working full time as a lawyer - proof that if she could do it, anyone could do it. 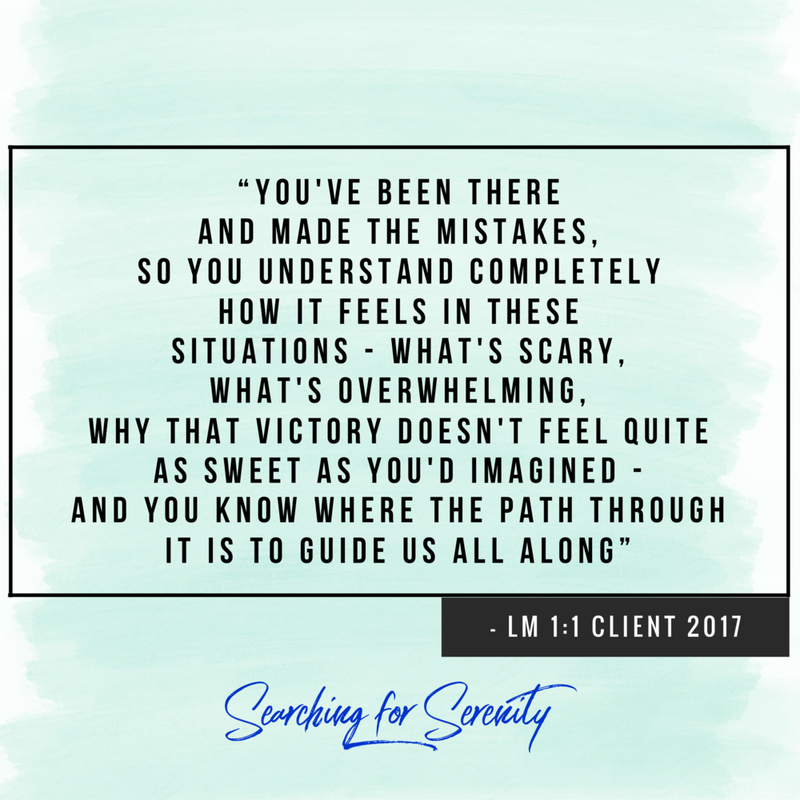 Since founding Searching for Serenity 2 years ago Leah has privately mentored dozens of women from teachers to medical professionals to lawyers to civil servants to marketing executives and more; launched more than two dozen courses, spoken on BBC Radio 5 Live and the Victoria Derbyshire show about insomnia and stress, written for LawCare and been featured in Stylist magazine, as well as speaking for a dozen podcasts and launched and co-hosted the success and wellbeing summit, JumpStart your Life. When she's not swearing on the internet, giggling with clients or launching training programmes and live events, Leah lives in Bristol with her partner, her dog Jasper and cat Smokey, both of whom are liable to co-host in live trainings at any moment! "You've turned my life upside down, in the best way possible!" "You've shown me that it isn't selfish to want a better quality of life for myself and you've shown me how to start seeing my value outside of what I achieve"